While I am always happy to add a high-quality, pedigreed antique Ideal or Steiff teddy bear to my collection, I have to admit that the bears that really make me smile tend to be mongrels: made by unknown makers of questionable skill, resulting in goofy and unusual creations. Here are two of my favorites. 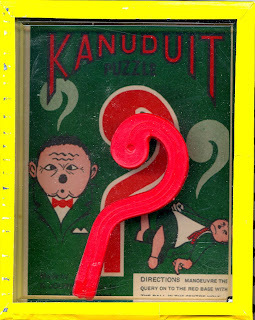 The guy with the hat, grin, and Jimmy Durante nose is a British ted from the 1930s. The somewhat startled-looking bear in the bow tie with the crooked ears is a 1920s German teddy. Here's a post about Some Other Stuff I like to collect, besides toys. I have a tremendous love for tacky old roadside tourist attractions, and am fortunate enough to live in a state that still abounds in them. Last week my friend and I took a little vacation and went up to the Mackinac Straits, visiting Mackinaw City (below the mighty Mackinac Bridge) and St. Ignace and Whitefish Point (above the bridge). This area is rich in many things: history, as it was home first to Native American tribes and later to scuffling between the French and British militaries; great natural beauty, as it's the spot where Lakes Michigan and Huron meet and the forested bluffs of the Upper Peninsula begin; and lots and lots of tourist attractions, as we're drawn to it for all three of these reasons. I was delighted to find that several of the old souvenir shops of my childhood still exist, and what's more, they still have abundant caches of old store stock: vintage tchotchkes dating back to the 1940s and occasionally even earlier. 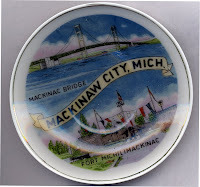 In Mackinaw, I found this great 4 inch souvenir plate, Made In Japan and dating from the 1950s or thereabouts. Also found was this souvenir postcard packet from Mackinac Island, printed in 1935. It's a beautiful vintage object in its own right, but its made even more fascinating by the inscription on the address lines, which reads: "Day Jack Porter will never forget. 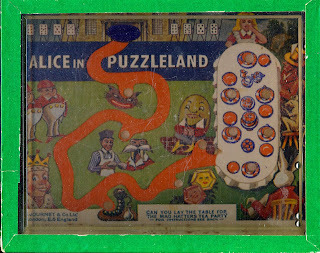 August 10 - 1952. 3rd Honeymoon." At first I thought, "oh, how sweet, that Jack Porter, whoever he is, was so romantically inclined that he penned this little note on their souvenir ". But then, inside, he wrote: "Jack Porter and his wife June walked about 8 miles on August 10, 1952." Now, for those who don't know, Mackinac Island is a beautiful and remote resort island in northern Michigan. It has an historic old fort, Victorian period shops and hotels, and spectactular natural beauty. It is also car-free, so to get around you have to walk, ride a bike, or hire a horse drawn carriage. I can't tell from his words whether Jack enjoyed his walk around the island with June, or if instead he secretly resented it, but I find myself wondering. Are they still married? Did they ever go back to the island? Did he hold a grudge for the next 40 years? Next, here's a peek into one of my favorite attractions from this area: Castle Rock in St. Ignace. The rock is a huge limestone outcrop that rises over 200 feet above the Lake Huron shoreline. From the top, there's a breathtaking view of the waters and forests of the Straits area. People love to climb it, so naturally an enterprising person built a souvenir shack at the bottom, and later added giant homemade sculptures of Paul Bunyan and Babe the Blue Ox, just for good measure. From inside the gift shop (where you can buy Paul and Babe salt and pepper shakers), you follow Paul's footprints along the floor and out the door to the climbing trail (after you pay your .50 admission, that is). Here's a picture from inside the gift shop showing "Paul Bunyan's Footprints", along with old and new postcards from the attraction. I'm nearly as fond of old postcards as I am of old toys. This is one of my favorites, because of its anthropomorphic subject (see earlier entries on Mr. Potato Head, one of my most loved playthings). 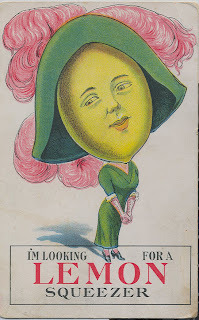 This card features a fantastic character on the front: a lemon lady with a gentle, bemused smile, wearing a lovely green ensemble. The caption reads: "I'M LOOKING FOR A LEMON SQUEEZER." Many postcard collectors seem to prefer their cards unused, but I enjoy seeing the messages penned on the back by the original senders. As best I can make out, this one was sent to a "Miss Leafa Fuller, State Sanatorium, Howell, Michigan," on November 18, 1912. It reads: "I received your card all O.K. Was glad to hear from you. How are you any way. I am O.K. Harley helped thresh here the 12 of Nov. I joined the M.E. Church Sunday. I am not going to school any more. I will be 16 the 19 of this month. So I won't go any more. Georgia Bowen and Miss Slater sang in the choir Sunday. Lavern + Beulah went over with me Sun. Hoping to hear from you soon. I remain your friend Lucilla," and a circled p.s. relates that "Clara Cooper has got a boy b aby." We finished restoring my antique coin op horsie ride this weekend (for the details, see a few posts down, or click on the "kiddie ride" or "mechanical horse" labels below). Here's video of him in action. While not one of the oldest bears in my collection, this teddy is one of the rarest. 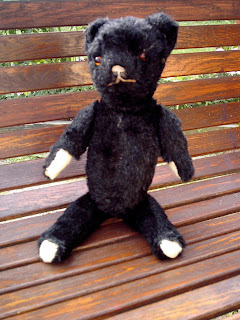 American made between 1910 - 1920, this simple "stick" type 14 inch bear is special because of his black mohair. For whatever reason, black bears were not popular and were made in very small numbers. I was lucky to find this one, and consider him one of my treasures. Here are two of my favorite bears, both American made. The larger is a 20 inch Ideal bear circa 1904 - 1906, while the smaller is circa 1903-1904. The little guy wears an original Teddy Roosevelt campaign pin that his first owner got during the president's whistle-stop tour. This provenance makes him rather smug; you can see how he holds his nose in the air! His larger friend is a beautiful creamy Ideal with a cinnamon colored nose and a crazy big hump: see the next pic for a view. I call him "Mr. Slumpy." 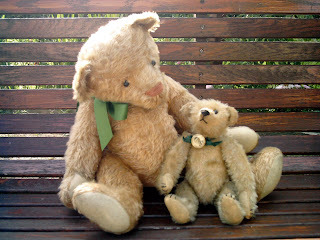 Here are two of my antique Steiff teddy bears, enjoying some early autumn sunshine. Measuring 9 and 13 inches, both date around 1908. 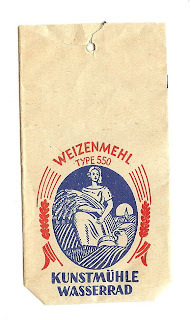 Another find for the shop was this 1930s German flour sack. The shelves are slowly filling up! I have an amazing mother. She has a gift for repair and restoration, and she can do just about anything: restore a Model T, re-key a vintage gumball machine, reupholster a Victorian sofa, rewire an old lamp, or refinish an antique oak bookcase (all projects she's completed). That she's doing these things in her 60s is even more remarkable to me. 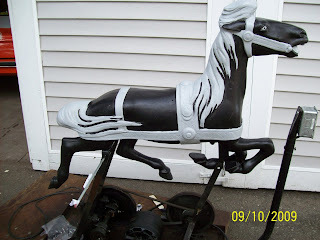 Earlier in the summer, I bought an old coin operated kiddie ride horse at an antique fair. It had been sloppily re-painted in very drab colors, including a heavy coat of black paint over the entire base, and mom was just itching to tackle it. I could see her looking appraisingly at it the first time she saw it, and after that, every time she stopped by, I heard, "You know, I could rewire that thing in a few minutes, and then we wouldn't have to worry about it catching the place on fire when you run it. And, while I'm at it, it would be nothing, nothing, I tell you, to just go ahead, strip it, and repaint it." This went on all summer. Finally last weekend I agreed I was ready to let him go, and before I knew it he was gone, whisked away to mom's workshop of wonders, where he was completely disassembled in mere moments. The next day it was reported that the mechanism had been thoroughly cleaned and regreased. And the rewiring job was finished, complete with a new electrical switch (mom: "like I told you, it took less than 20 minutes!"). Yesterday the primer was applied, and we picked out the paint colors. The first picture below shows the stripped horse, followed by the primer stage. The next picture shows his first coat of paint, and the final image is the finished project. He's a black circus pony now! 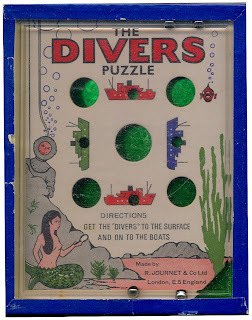 Vintage dexterity puzzles are some of my favorite toys to collect. The little worlds behind their windows are so inviting, their lithography is lovely, and they're just fun to play. Here are some of the highlights of my collection. 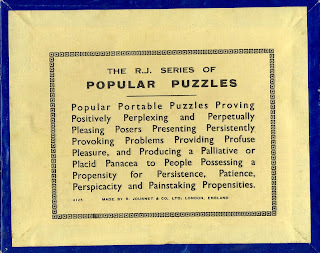 These were all made in England by R. Journet & Co., I'm guessing in the 1940s. 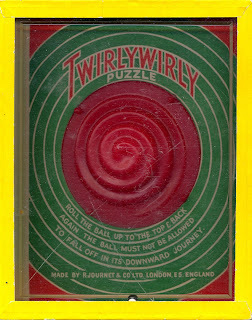 Besides the games on the front side, each of these puzzles features this tongue-twister on the back. See how quickly you can say it! 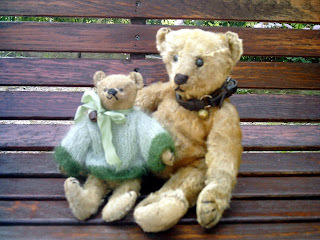 Presenting two of my favorite antique teddy bears, both by unknown American makers. The larger bear is about 24 inches tall, and dates to around 1910-1915. He wears my little brother Jody's handmade sailor suit: Jody wore this during his "terrible twos". 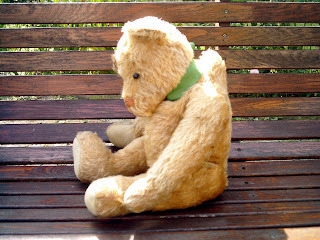 Bear's little friend is a 10 inch ted from the 1920s. They like to sit in the big armchair and watch the squirrels in the maple tree outside. When hunting for antique teddy bears, I'm usually after fully jointed mohair versions, made by major German, British, or American makers. I was consequently surprised to discover how much I liked this lot: a handmade set of the 3 Bears, made from a distinctly "low end" fabric, in a floppy, rag-doll style. Dating to the Great Depression, I imagine they were some loving parent's attempt to create toys for their child who would otherwise be lacking. It's clear a lot of love and care went into their construction, from their painstakingly embroidered faces to their handsewn outfits (daddy bear even has a teeny-tiny hemmed handkerchief peeking out of his pocket!) It was love at first sight for me, and I simply had to bring them home.